Taiwan, a jewel box floating in the oceans of Asia, has been recognised for its cuisines in the last decade or so. Its night markets and street food scenes have become one for the most popular places tourists visit during their trips. Although derived from the mainland Chinese cuisine, Taiwanese cuisines also had strong influences from Japan, the Aboriginal Taiwanese and some Western cultures. Hence, it’s now quite unique and different from Chinese cuisines. 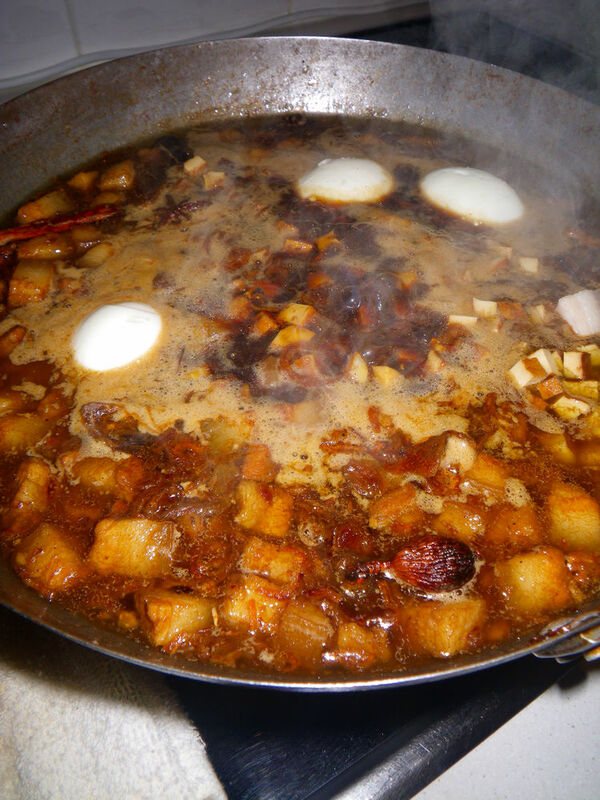 Dishes such as Lu Rou Fan, Salty Nuggets, Taro balls and many more, are widely recognised in many parts of the world. 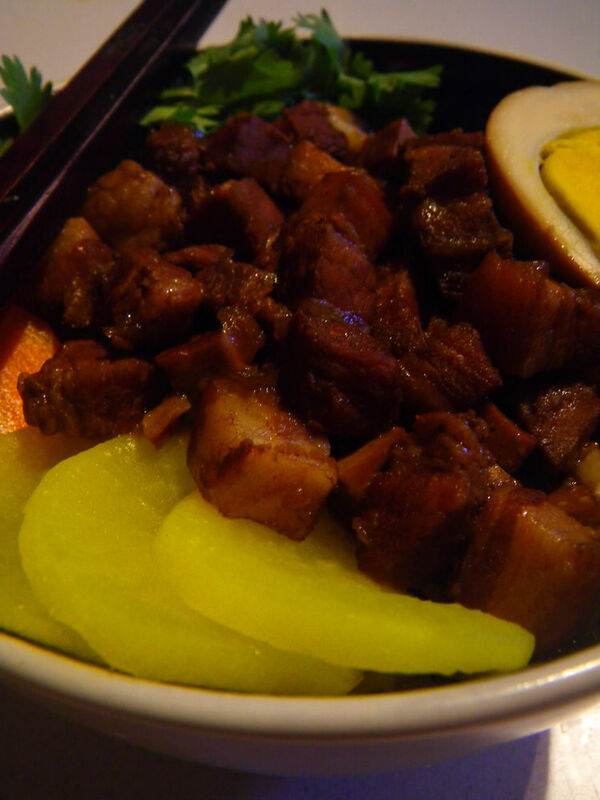 Lu Rou Fan is the name given to the dish below as it used braised pork meat, Lu Rou and rice. It is extremely popular for visitors of many of Taiwan’s “never ends” night markets, small cafes and pop up restaurants. It’s easy to make too. Although it may not be a healthy option, it can be very tasty if you like Asian flavours. In fact, I always had wonders whether the Lu Rou Fan can match well with Australian produce. In this recipe, I used Murray Valley Pork rolled pork loin to cook for my melt-in-your-mouth braised pork. 1. Place the pork loin roast in cold water with the white wine and boil for about 20 mins on medium heat until the pork has been cooked through. 2. 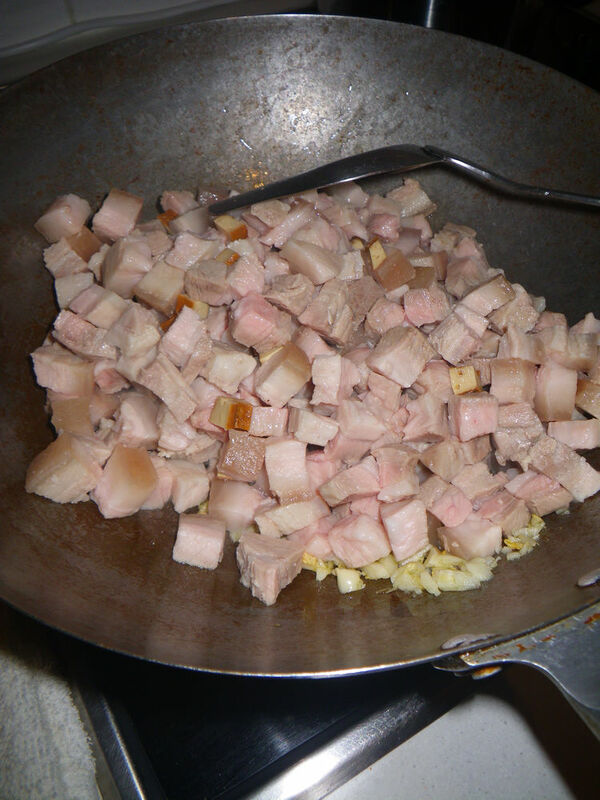 Place the cooked pork in fridge to let it cool completely so it can be easily diced into small cubes. 3. 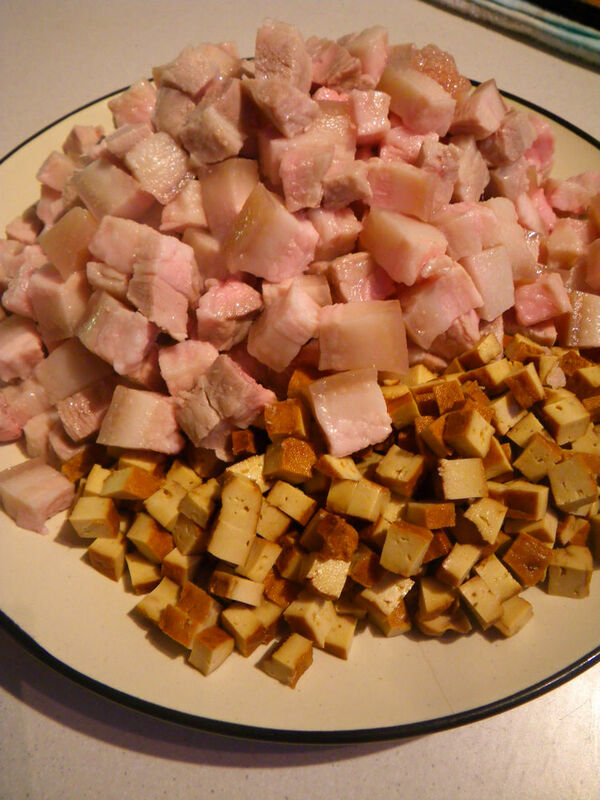 After cooling, cut the pork into small cubes. The size is really dependent on you, but don’t make them too big. 4. Oil in the wok. You can use a large sauce pan if you don’t have a wok. Add in the garlic clove to stir fry until some good aromas can be smelt. 5. Add in the soy sauce, salt, sugar and fried shallots and stir to mix well. 6. 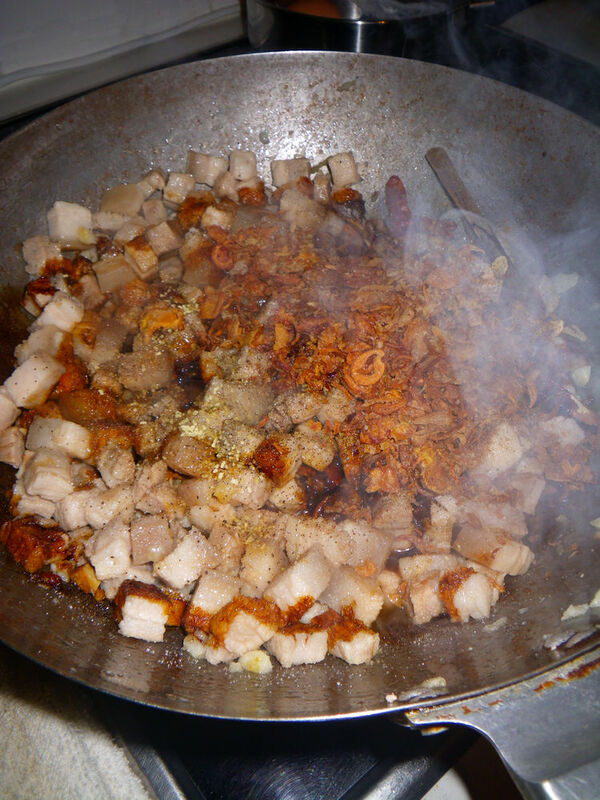 When mixed well, half fill the wok with cold water and add the eggs, all the spices, the deep fried tofu cubes and the powdered chicken stock powder. Let the content boil for 5 minutes. 7. 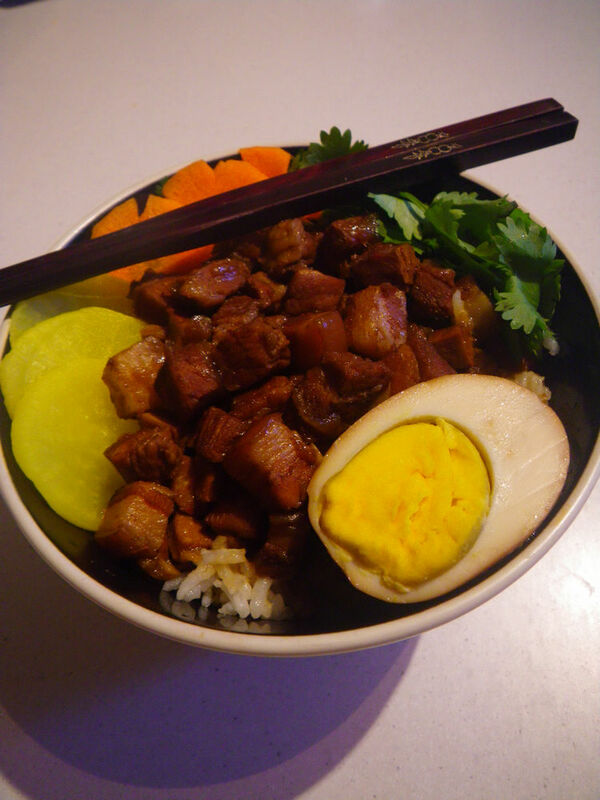 Transfer the content to an electric pressure cooker and cook for 40 mins to create a true “melt in your mouth” experience or 35 mins if you still prefer to have tender pork. 8. Now plating up! Fill 3/4 of a bowl with rice. 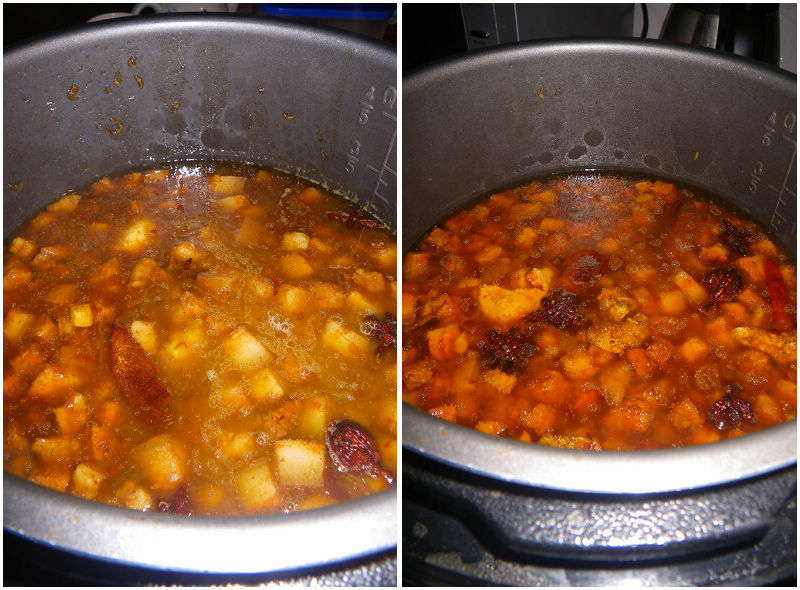 On top of the rice, in the center, place the content of the above without the jus. Then place half of an egg on the side along with the preserved radish, carrot slices and coriander leaves. Spoon over some of the jus to the pork and enjoy! The dish tasted brilliant! The pork has sucked all the flavours of the spices and can literally melt straight in your mouth. It was sublime! The Murray Valley pork before cooking was pink and it already had some flavours. 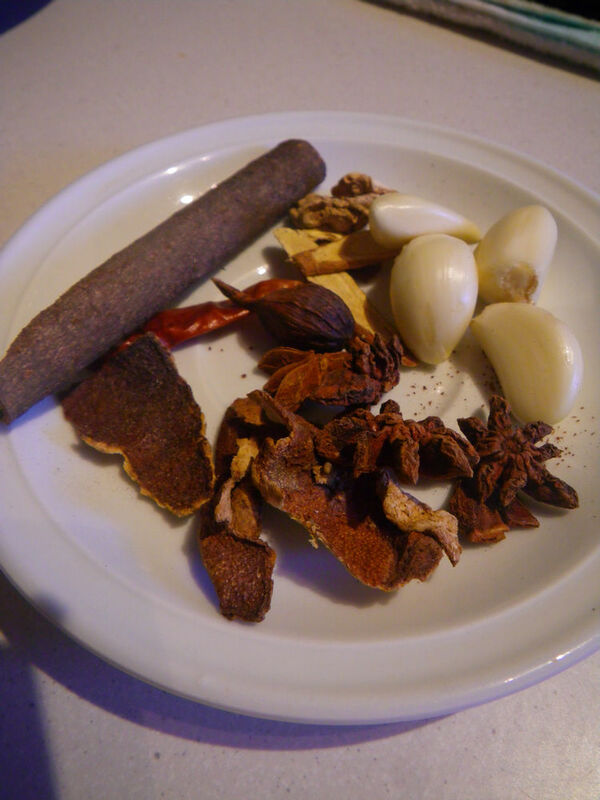 Hence, all these spices lifted the meaty flavour up and added different layers of taste sensations on the palate. The egg was cooked to perfection and also contained most of the complex flavours in the yolk whereas the addition of the preserved radish contributed a cleansing effect so that before every mouthful of the meat, the palate has been reset to it’s original state. If you like authentic East Asian flavours, this dish is a must to try at home. Although it may look oily, the dish was quite clean on palate and was not greasy at all. Next post coming up on Adelaidefoodies.com will be my new adventurous recipe, Wallaby meat balls. Stay tuned! Like this but I also like the pickles too. Goes well with the fatty pork. Exactly Kimmy! The pickles are always good to reduce the fat. I love having them with all oily food. G’day! 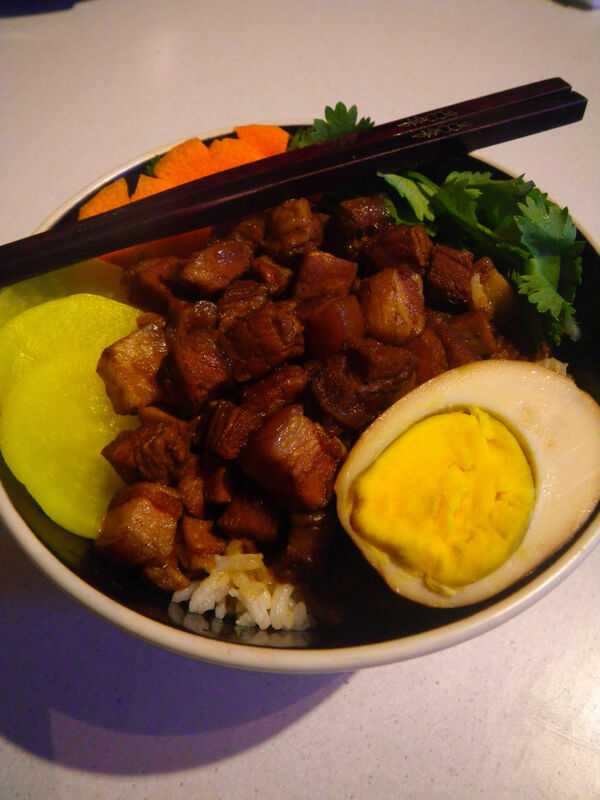 This is one of my favorite Taiwanese dishes to make Xin! 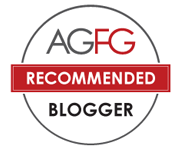 Yours looks terrific and wish I could come through the screen and try now! I never had any dish like this in my life! Maybe I should go to Chinatown to explore some Asian restaurants. I don’t know whether they have this dish in Chinatown though. I am a frequent dinner in Chinatown and I love Asian dishes. It’s strange that I never heard of this dish before. With the dried orange peel, did you dry them yourself or are they available at an Asian grocer? The ones I used are dried by myself but I think they are available in Asian grocers. I am thinking of making a chicken version of this dish so it can be a kosher version. Emm sounds nice! The chicken dish can reduce the level of fat too. I may try sometime too.